We are a leading Manufacturer of hot runner temperature controller, humidity controllers, data logger, scr power circuit, flame proof temperature controller and moisture controller from Ahmedabad, India. We offer high quality Humidity Controllers that are specially designed in order to control process of humidity without extensive operator involvement. 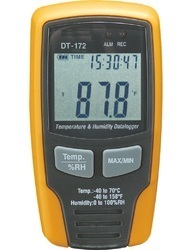 There Digital Temperature Controller are many commercial and industrial applications where artificially controlling humidity levels can provide a significant improvement to the overall operation. Further, the offered products are also known for features like durable finish standards, reliable performance and user friendly interface. By specifically setting and maintaining humidity, temperature, and air exchange standards for the operation, overall profitability is enhanced. Loggers is uniquely suitable for compactly configuring a data acquisition environment using a PC as a human interface. Model 8040 is available in two versions, a half 19" rack module that can acquire data from upto 48 channels, and an expandable full 19" rack module with a maximum of 112 channels. Both versions internally log and also transfer measured variable in real time to PC. They are remotely controlled by the host computer through a set of commands and transmitted in a RS-485/RS232 network. The modular design also provides more flexibility in the system configuration. The Datalogger system architecture includes a power supply card, CPU card with a built-in RS-232/RS-485 communication port, input and output cards. Datalogger enables user to log the real time data with time stamping. One can select input channel number for log and print purpose with specified time interval from operator terminal keys or using Masibus mACplus software. Print on demand facility is also available. mACplus software works on windows platform and is used for datalogger configuration, calibration and retrieving logged data to PC. Alternatively, operator terminal is used for local display, configuration and programming of datalogger. Operator terminal is equipped with 24 keys and uses 2x16 alphanumeric LCD screen as user display interface. Model 8040 is much smaller and lighter than our previous model occupying significantly less space. It can provide high speed measurement having a scanning speed of 1 second for 112 channels. 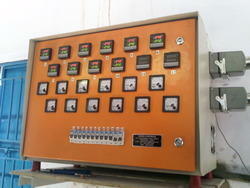 Provision for 8 channel DO module provides alarm signal to annunciate abnormal process condition. 4 alarm levels per channel can also be configured. With the aid of modern tools and sophisticated technologies, we have been ale to manufacture, supply, trade and export SCR Power Controller Circuit. This is a self-supporting power control house, which is mounted on a three or four runner oilfield skid. These circuits are provided with lifting eyes or a draw bar at each end of the house for transportation on a trailer. The SCR Power Controller Circuit offered by us is widely acclaimed in the market for their features like economical operation, low maintenance, compactness and portability. With the expertise of our professionals in this domain, we are able to bring forth Flame Proof Temperature Indicator Controller. Accept input RTD, thermocouple, voltage, current, these controllers are flow, tachometer, voltmeter, ammeter, temperature, pressure, humidity and level. The input is passed through suitable filters to eliminate unwanted signals, these controllers are known for good stability and sets the calibration point accurately. Available in many models, this Flame Proof Temperature Indicator Controller is housed in a compact sheet metal/Plastic case. Our valued customers can avail from us a flawless Moisture Controller. These controllers are manufactured under the supervision of our experts by making use of optimum-grade raw material like aluminum, stainless steel and basic components in accordance with the guidelines laid by industry. Demanded by several industries, owing to their features like water proof, sturdy construction, excellent performance and substantialness, our offered Moisture Controller is available in different specifications to meet the variegated demands of customers. A muffle furnace (sometimes, retort furnace) in historical usage is a furnace in which the subject material is isolated from the fuel and all of the products of combustion including gases and flying ash. After the development of high-temperature electric heating elements and widespread electrification in developed countries, new muffle furnaces quickly moved to electric designs. 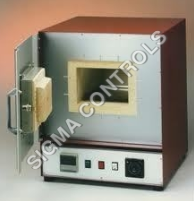 Today, a muffle furnace is (usually) a front-loading box-type oven or kiln for high-temperature applications such as fusing glass, creating enamel coatings, ceramics and soldering and brazing articles. They are also used in many research facilities, for example by chemists in order to determine what proportion of a sample is non-combustible and non-volatile (i.e., ash). 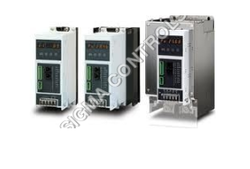 Some digital controllers allow RS232 interface and permit the operator to program up to 126 segments, such as ramping, soaking, sintering, and more. Also, advances in materials for heating elements, such as molybdenum disilicide offered in certain models by Vecstar, can now produce working temperatures up to 1800 degrees Celsius, which facilitate more sophisticated metallurgical applications. The term muffle furnace may also be used to describe another oven constructed on many of the same principles as the box type kiln mentioned above, but takes the form of a long, wide, and thin hollow tube used in roll to roll manufacturing processes. Both of the above mentioned furnaces are usually heated to desired temperatures by conduction, convection, or blackbody radiation from electrical resistance heating elements. Therefore there is (usually) no combustion involved in the temperature control of the system, which allows for much greater control of temperature uniformity and assures isolation of the material being heated from the byproducts of fuel combustion. We are one of the reckoned manufacturers, suppliers and exporters of a wide range of muffle furnaces that is used in various industries. Fabricated as per the set industry standards, these are widely used for heating purposes in chemical and R&D industries. We also offer customize solutions of our Muffle Furnaces at market leading prices. Supplied with silver fuse etc. Driven with perfection, we are engaged in facilitating our customers with Three Phase SCR Power Controller. These controllers are provided with single/three phase/two phase loads and A.C. SCR power controllers for resistive inductive loads. Our offered controllers are highly applicable for A.C Power control of inductive, resistive loads of any capacity and resistance metal gathering and heating machines. 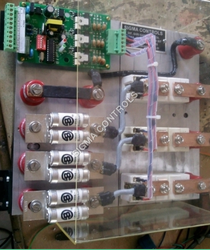 The Three Phase SCR Power Controller offered by us is tested on various parameters to ensure high functionality.